Hand-made Delabole Roofing Slate is split from only the very best of stone that comes from 50 to 150 metres deep down in the Delabole Slate Quarry and is still made in all the popular sizes and traditional ranges. Sized Slate...Hand dressed to a nominal length and width, a number of different sized slates are produced ranging from 24" x 12" (610 x 305mm) to 12" x 6" (305 x 152mm). Randoms...The traditional West Country roof and slightly heavier than sized slate. Made with lengths varying in 2" increments from 24" to 10" (610mm to 254mm) with random widths. Larger sizes are available by special order. Peggies...The trademark of West Cornwall and quaint old fishing villages. Peggies or 'Scantle Slate' as it is often called are made in a range of sizes from 12" to 6" long (305mm to 152mm), with random widths. Randoms and peggies are traditionally laid in diminishing courses, with the longest slates being fixed at the eaves, diminishing to smaller slates at the ridge. This is a particularly attractive and environmentally friendly method of roofing. Delabole Roofing Slates have dressed edges, a natural riven surface and are predominantly blue/grey in colour. New slates will weather to a pleasing mellow shade, finally taking on the "aged" light grey look after 50 years or so. Delabole Roofing Slates have a known life of more than three hundred years and will provide an efficient and attractive roof if properly and traditionally laid or where laid in accordance with BS 5534 Part 1 rev 1990. Due to the longevity of the material, repairs to Delabole Slate roofs are generally necessitated by failure of the roof timbers or nails. Delabole Slate will in most cases, be suitable for re-fitting. We do not hole slates before supply. Holing should always be carried out by the slater who should at the same time grade slates into heavy, medium & lights for coursing on the roof. Holing should be performed by rotary drill or holing machine. Do not use a "pick" or "nailthrough". 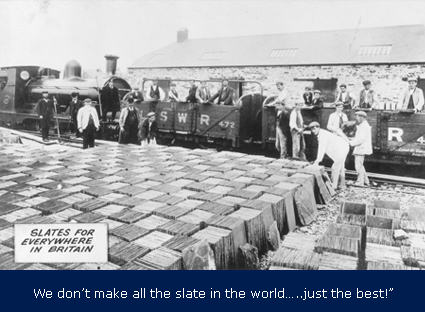 Delabole Slates are extremely strong and will resist these methods resulting in higher breakage. Demand for this, a "World Best product", is very high, so whilst significant stock of roofing slates are normally held, to avoid disappointment customers are advised to plan well in advance. Please place an order for slate as soon as possible, so that we can allocate space in our continually busy schedule.